In response to global operator demand, MoCA is now offering a technology solution that applies new firmware feature upgrades on top of MoCA 2.0 technology. This new extension of MoCA 2.0 is called MoCA 2.1 offering 500 Mbps throughput and MoCA 2.1 Bonded offering 1 Gbps throughput. The availability of MoCA 2.1 and MoCA 2.1 Bonded provides operators with the performance and the additional five features they need for further design and implementation of their networks. 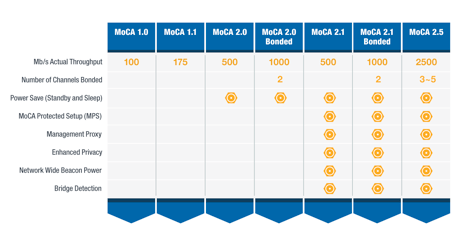 As operator and end user requirements for bandwidth increase, service providers can then migrate to MoCA 2.5 using the same five features offered in MoCA 2.1/2.1 Bonded. · MoCA protected setup (MPS): Easy setup of new nodes with unique password sharing via push-button (similar to Wi-Fi WPS). · Management proxy: Management of nodes that don’t have upper layer management support by supporting management queries from one node on behalf of other nodes. · Enhanced privacy: Secure data communications with a longer password using different keys between MoCA 2.1 nodes compared to MoCA 1.1/MoCA 2.0 nodes, along with the ability to control data forwarding of legacy nodes to and from MoCA 2.1 nodes. · Network-wide beacon power management: Provides better control of peak signal power on the coax by configuring the beacon power of nodes to an absolute level (within tolerance of the hardware) and advertise that level to other nodes so that the same value is used after any handoff. · Bridge detection: Ability to distinguish between nodes belonging to different networks and pass operator specified information between nodes before admission, as well as pass that same information to upper layers to prevent neighbors from forming a common network. “We now offer a broad suite of specifications inclusive of various performance modes and features providing the versatility to support and compliment IOT,” said Charles Cerino, MoCA president.